The Overview report in Backlink Analytics is a great place to start your competitive research. 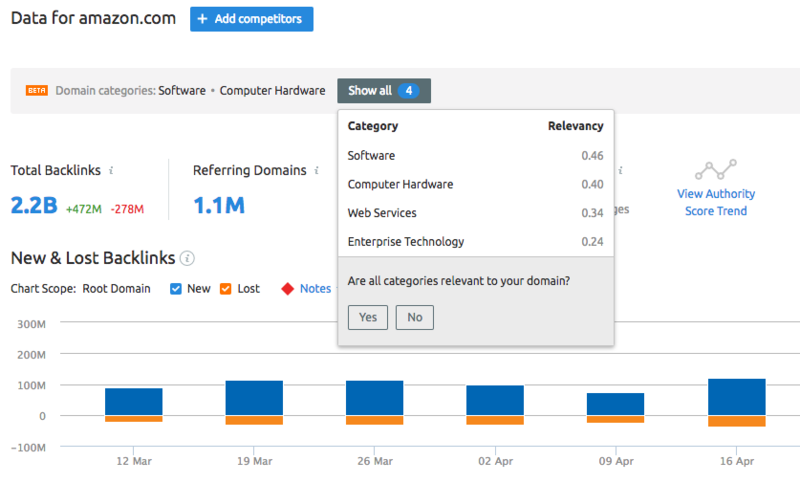 Enter your competitor’s domain in the search bar and begin collecting insights on a competitor’s most recently built links, overall backlink profile size along with their most important partnerships and referring domains. If you don’t know where to start and need help picking out the best competitors to analyze, you can use the Backlinks Competitors or Organic Research Competitors reports. Once you’ve pinpointed your competition from these reports, you can look them up in Traffic Analytics to determine how much of your competitor’s traffic is “referral traffic,” or organic website traffic from backlinks. The top of the Overview report shows users the domain’s total number of backlinks, referring domains, and referring IPs going to the queried domain. You can click on the total backlinks number to go to the Backlinks report, click on the referring domains number to go to the Referring Domains report, and click on the Referring IPs number to be taken to the Referring IPs report and finally you can view your authority score trend in a small graph in a popup window. Your authority score is a compound metric that scores the overall quality of a domain. We use Domain Score, Page Score, Authority Score and Trust Score to measure the quality and influence of a domain’s backlinks. The higher these scores, the more impactful it would be for a website to acquire a backlink from the domain. To find out more about all of these different metrics, check out the article here. If you want to analyze a single URL or subdomain of a competitor, use the Report Scope filter at the top of the report. This will change the scope of the data being analyzed. Root Domain will be selected by default, displaying all of the backlinks pointing to a domain (everything on ebay.com, for example). Select Subdomain to take into account any prefixes entered before your domain. For example, if you enter “starwars.wikia.com,” it will not report on any backlinks leading to wikia.com site without the “starwars.” prefix. Or, if you wanted to investigate the backlinks to a specific subdomain of your site (blog.competitor.com for example), you can do that with this filter. Select URL to analyze the backlinks of a specific URL (http://ebay.com/motors/nissan for example). When you query a URL in this report, you’ll see the Page Score instead of Domain Score in the box at the top of the report. After you enter a domain, SEMrush will gather the relevant categories that your domain falls under. Click on show all to see all of the categories that the domain falls under. These categories are determined by certain factors associated with the domain such as keywords and anchors. Next to each category you will see a rating that will indicate how relevant that industry is to the quired domain. This scale is based on 0 to 1, the closer the rating is to 1 the more related the domain is to that category. The second part of the Overview is the New & Lost Backlinks graph. You can change between viewing the past month, past 6 months, year, or all time to identify any seasonality or consistency in your competitor’s link building strategy. You’ll see SEMrush Notes plotted on the graph to indicate any major Google algorithm changes or SEMrush database updates that could affect a domain’s backlink profile. If you enter your own domain here, you can also see how many backlinks your domain has recently lost. If you think any backlinks were removed by mistake, you should reach back out to the referring site and ask them to restore your lost link. To see the specific links that were lost, jump to the Backlinks report and use the filter for “lost” backlinks and the table will populate the links SEMrush no longer sees pointing to the queried domain. The rest of the Overview report will provide statistics on the various qualities of the domain’s backlinks: types of backlinks (1), follow vs no follow links (2), TLD distribution (3), top countries sending backlinks (4), top anchors (5), and top anchor terms (6). As well as the above-mentioned metrics, you can use the backlink audit widget to pull data directly from SEMrush Backlink Audit . If you already have a backlink audit set up for the quired domain, this data will automatically be shown. However, if you do not, you can pull this data by clicking on the green “set up backlink audit” button. The first chart shows the distribution of text, image, form, and frame links. Text links are simply hyperlinks to text. These are the most common forms of links on the internet. Image links are simply images that have hyperlinks embedded in them. Form links are hyperlinks sent via a search bar or another element that users can modify by entering text. Frame links are hyperlinks embedded in HTML frames, which are dividers in your browser window that separate areas of HTML. These types of links are not as common as text or image links. You can click on any of the bars to go to a pre-filtered backlink report listing all the links that make up that percentage. Here you can determine if your competitor has significantly more image backlinks than you. Analyzing image backlinks can give you an insight on whether you should try to promote your product or service with better photography or visual content to acquire more image links to your domain. High quality and shareable images can be an effective strategy for e-commerce consumer products, so use this stat to measure yourself against your competitors. 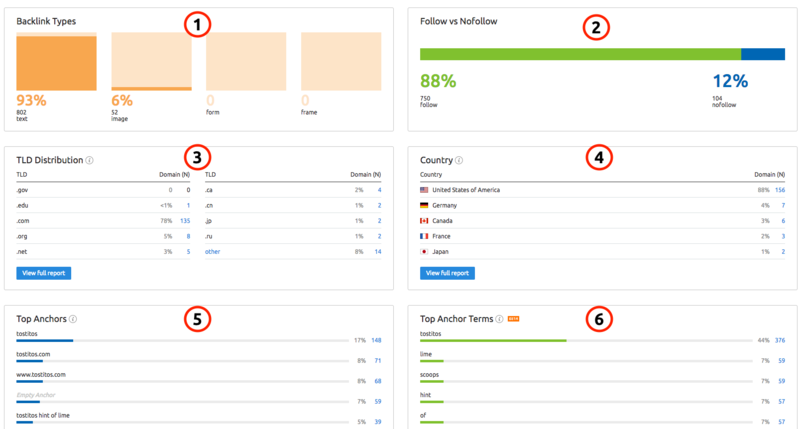 The second bar graph breaks down the Follow and Nofollow distribution of the backlinks. Follow links are links that instruct search crawlers to follow, and therefore, boost the SEO of the linked-to site by communicating trust and impacting organic rankings. Nofollow links send users to another site if clicked on, but tell search bots not to crawl the link. Therefore, a nofollow link conveys less of a trust signal that would help the SEO of the linked-to site. Nofollow attributes are commonly applied by webmasters on any paid links, user-generated content, or in comment sections of websites. There are a number of reasons why you would want external links from your site to be Nofollow, mostly as a means to prevent other people from abusing your site just for its backlinks, which would likely end up hurting your site’s SEO. You can read Search Engine Land’s infographic about the rel=”nofollow” tag that explains more about why webmasters would want to use the tag. Below these charts will be the table displaying the TLD (top-level domain) Distribution. Certain types of TLDs, such as .gov, .edu, and .net carry different weight regarding passing along trust signals for SEO through their backlinks. In the screenshot above, the TLDs sending the most links were “.com”, followed by “.org” and then “.net” TLDs. “Other” TLDs make up 11% of the backlink profile. Clicking on any of the blue linked numbers in the table will bring you to a filtered Referring Domains report. Or, clicking on “other” or "View full report" from this table to open a TLD Distribution report (example below). This report lists the domain's entire backlink profile broken down by top-level domains. With this report, you can determine if your competitors have a strategy to acquire links from trusted educational (.edu) or governmental (.gov) websites. If they do, it could be a good strategy for you to adopt for your own website. To see all of the .edu or .gov domains that are linking to your competitor, use the Referring Domains report and add a filter for Include - Zone - edu or Include - Zone - gov. The fourth table lists the countries sending the most backlinks to the domain. We determine the country of a backlink’s origin by the IP address associated with the referring domain. 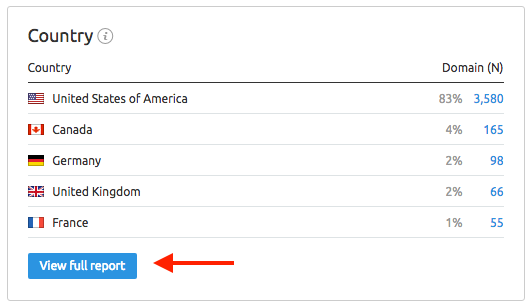 Select "View full report" from this table to open a Geo Distribution report. This report lists the domain's entire backlink profile broken down by countries with the referring domains. This is an easy way to see how your competitor’s strategy reaches an international audience and what nations your competitor gets the most attention from. Clicking on any of the blue numbers in the table will take you to a referring domains report with a filter for the country selected. This will show you every domain that SEMrush found linking to the queried domain from each country. Use this report to analyze the international scope of a competitor’s PR or link building strategy. If they have a ton of links from a foreign country that you know they don’t do business in, perhaps they bought cheap links from an online vendor that sells fake links overseas. However, if they have a high number of links from European countries that have markets for your product or service, then you can consider targeting these countries with your online efforts as well! 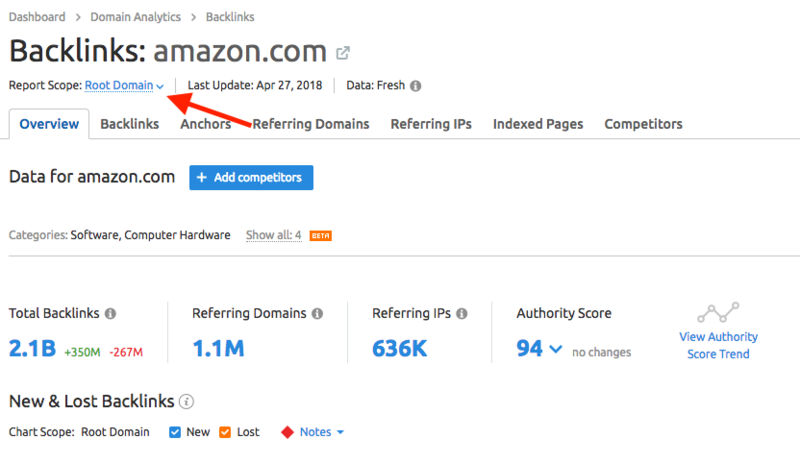 You can see the top anchor texts used in your competitor’s backlinks at the bottom of the overview, and hit “View full report” to open a complete report in the Anchors tab. This data has the potential to give you insight into your competitor’s link building strategy. For websites that sell products or services, it is common to see anchor texts that reflect their top products or topics related to their market. If you see this in your competitor’s backlinks, you can determine what products they like to promote the most with link building. Top Anchors lists the full anchor texts that appear most frequently in the domain’s backlink profile, and Top Anchor Terms lists the individual words and phrases that appeared the most frequently in the top 100 anchors from the domain’s anchors report. At this time, domains with over one million backlinks are not supported with this feature. If you want to save a PDF of a competitor’s overview, whether to save for your own research or send to a client or colleague, you can use the [PDF] button located at the top right of the report. Click here and choose to email, schedule, or brand the report. White-label reporting from SEMrush is available with a Business Level Subscription. The next chapter of the manual is the Backlinks report. Or jump ahead to Anchors, Referring Domains & IPs, Indexed Pages, or Competitors.